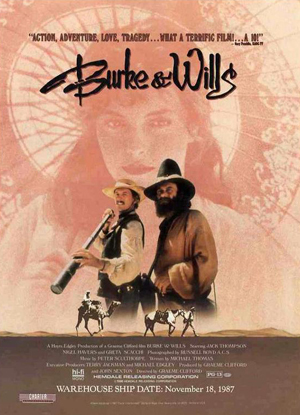 The movie premiered in Melbourne on 2 November 1985 before Prince Charles and Lady Diana; the first Australian Royal Premiere. It opened in other Australian cities on 7 November 1985, was shown at the Cannes Film Festival in May 1986, the Toronto Film Festival in September 1986 and was released worldwide in early 1986. With a runtime of 140 minutes, Clifford had originally wanted to make a three hour movie with an intermission. Eventually he settled for two hours and twenty minutes and felt that he did not discard any scenes of importance. Australia: 1985 by Hoyt's Edgley Productions, PG. USA: 1986 by Colombia Pictures Production, PG-13. Australian VHS-PAL: 1987 by RCA, ​Columbia Pictures, ​Hoyts Video, Film Entertainment Corp & Charter Entertainment. USA VHS-NTSC: 26 October 1988 by Nelson Entertainment & Charter Entertainment. USA Laserdisc release, UPC: 08258902146. Focus puller: Peter Menzies Jr.